At the Bar Exam Toolbox, we’re firm believers in the importance of practice when you’re studying for the bar exam. And you probably know you need to do lots of practice problems to pass, right? Unfortunately, that can be easier said than done. Help has arrived! If you want limitless access to real bar questions, conveniently sorted by frequency and topic, read on. The Brainy Bar Bank is your one-stop shop for MEE and/or MPT bar exam practice questions. The BBB makes it quick and easy to find what you want, whether that’s working on a specific topic or practicing a heavily-tested area. Find out more below, or sign up now. Practice is critical. But targeted practice is even more important. Instead of just doing questions randomly, you want to ensure you’re focusing on the most commonly-tested areas and on your personal weak spots. 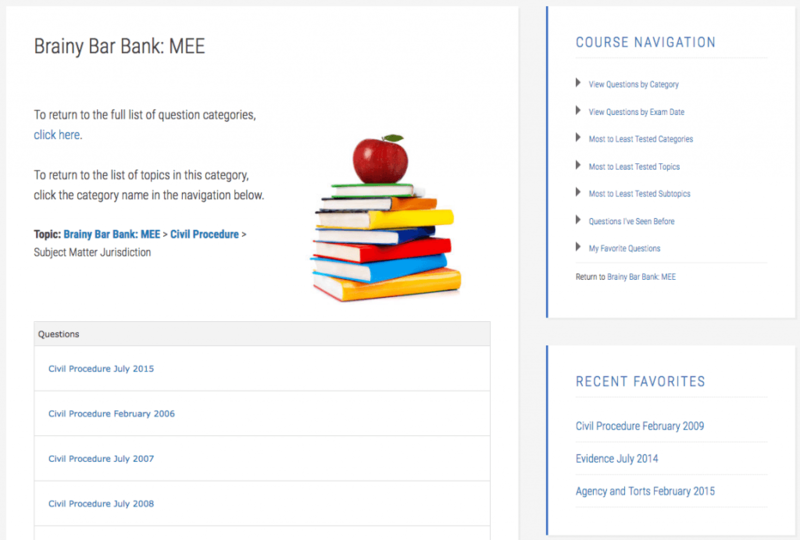 The MEE Brainy Bar Bank collects over 12 years of real MEE bar exam essay questions (more than 160 questions total). Each essay question is categorized by area of law (Torts) and one or more topics and subtopics (Intentional Torts: Assault and Battery). 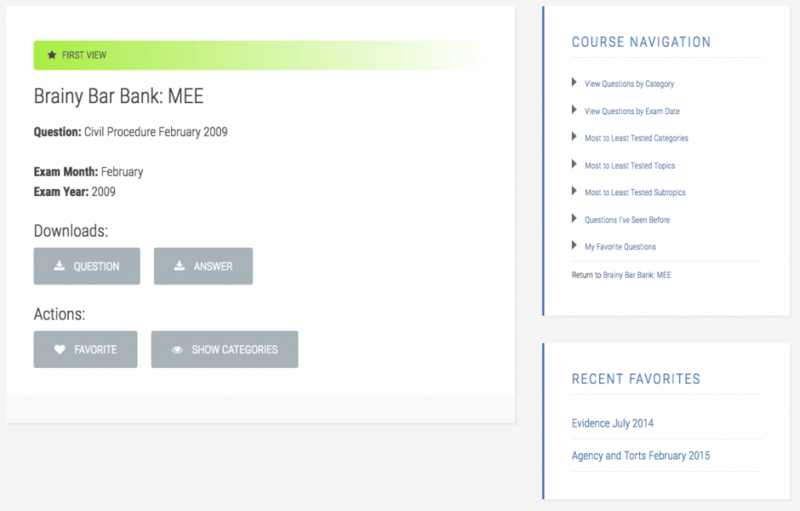 You can browse by category areas, topics, and subtopics, mark your favorites, view the most- to least-commonly tested areas/topics/subtopics, and easily keep track of which questions you’ve recently seen. Say you’re struggling with Civil Procedure, and are especially concerned about Subject Matter Jurisdiction. All you have to do is sign into the BBB, select “Civil Procedure,” then select “View Questions” under Subject Matter Jurisdiction. You’ll then have access to all of the past questions that include Subject Matter Jurisdiction as an issue. 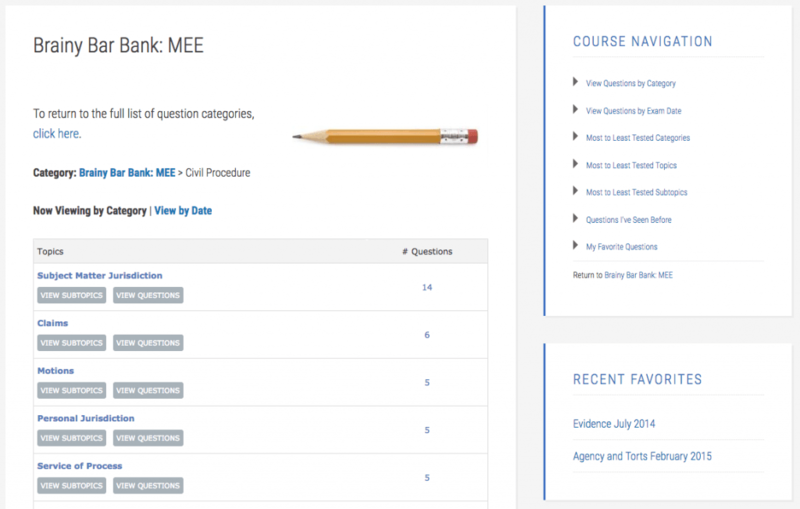 You can also drill down within the Subject Jurisdiction topic, to find questions covering more specific subtopics such as diversity of citizenship, supplemental jurisdiction, etc. Click on “View Questions” under “Diversity of Citizenship,” for example, and you’ll find only questions that require a discussion of diversity of citizenship. Once you’ve narrowed things down, you can easily select your question from the list, download it, and start writing! Think you’ll want to return to this question later? Just mark it a Favorite, for easy access! All the questions you’ve recently looked at will be on your “Viewed” list, for easy reference. Ready to get started? Click here to purchase now! Not Sure What to Work On? Deciding where to focus your time is one of the hardest aspects of efficient bar study. 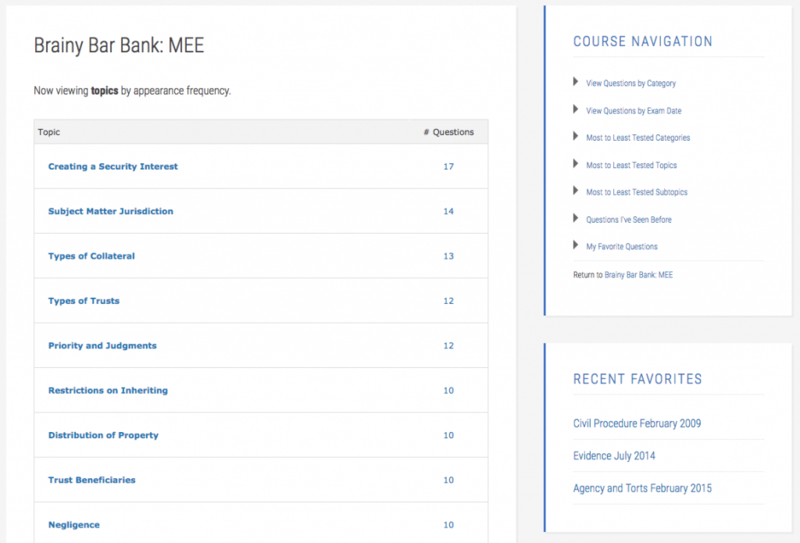 With the Brainy Bar Bank, you can easily see which areas of the law are most heavily tested and can even drill down into the most heavily-tested individual topics and subtopics. This feature allows you to be sure you’re ready for the questions that are most likely to appear! Using the Brainy Bar Bank, you can simply click to view an overall list of heavily-tested categories, topics, and subtopics. Here’s the overall category list. You can also see the most-commonly-tested individual topics. Within each category and topic, you can also drill down to see what’s most commonly tested. For example, say you look at the list of frequently-tested categories, and realize you need to do more work on Family Law. 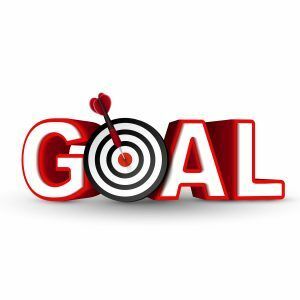 Just click the Family Law link to see where you might want to focus your efforts. And you can further drill down within topics, to really target your work. Here, we’re looking only at subtopics related to child custody and visitation, each of which has its own associated questions. Want to get started? Click here to purchase now! Having a practice question is great, but how will you know if you’ve hit the key points you need to pass? Don’t worry! Each question includes the issue keys released by the graders. Want even more guidance on your writing? learn more about our Writing of the Week program, where a Bar Exam Toolbox expert walks you through the question and answer. (Available at a special price together with the Brainy Bar Bank). Prefer to Take a Mock Exam? No Problem! If you’d rather sit down and answer all of the essay questions from a particular exam, the BBB can help you there, too! Just choose the year and month of the exam you’d like to tackle, and you can easily download all of the questions. If you really want the element of surprise that’s always part of exam day, have someone else print out the exam questions for you so that you don’t have advance notice of the topics you’ll be facing. It’s also important to practice the performance test portion of the UBE, which is the MPT. 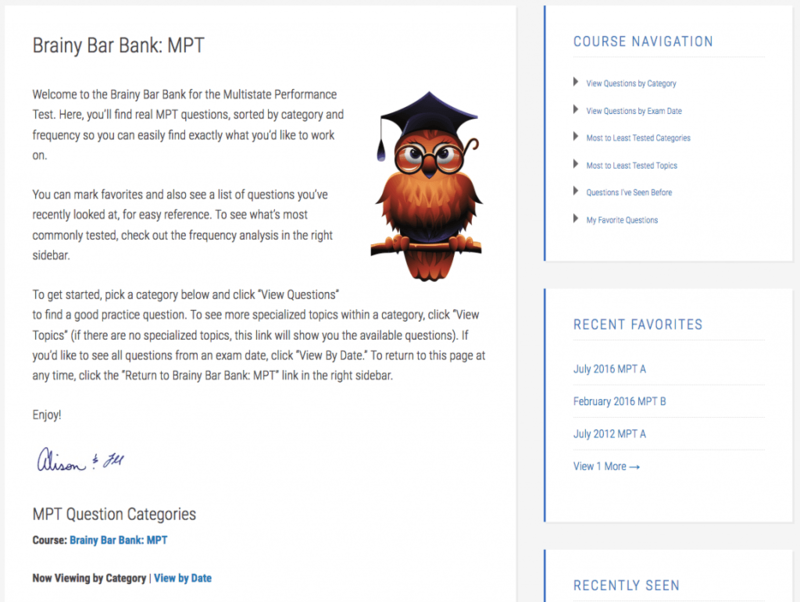 The MPT Brainy Bar Bank gives you tons of practice materials, going back 20 years! You can purchase the MPT version together with the MEE at a special price, or just get the MPT alone. Jump down for all pricing info. Each performance test is categorized by the type of document requested by the examiners, so you can easily see what’s typically covered and dive into your weak areas. For example, if you need to practice a Memo just select that category to see what’s available. 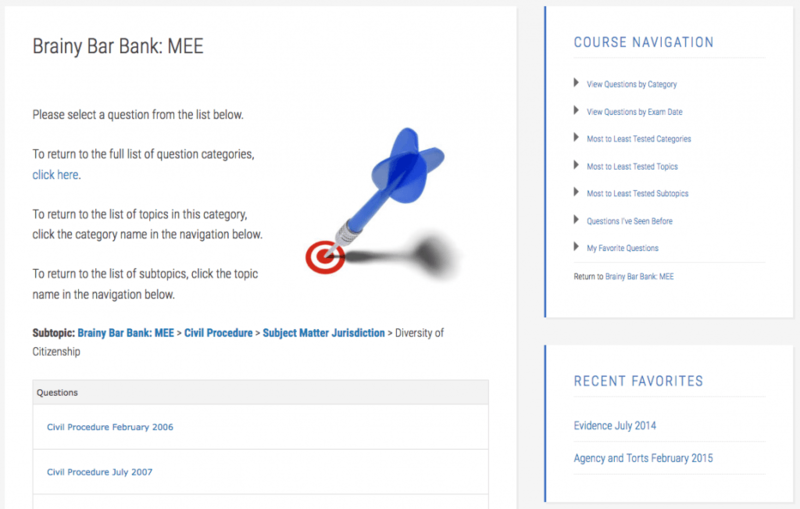 In this case, there are two sets of Memos available, so you can choose the type you’d like to practice, and view available questions. The MPT BBB also includes a frequency analysis, so you can easily target the types of documents you’ll be most likely to face on the exam! 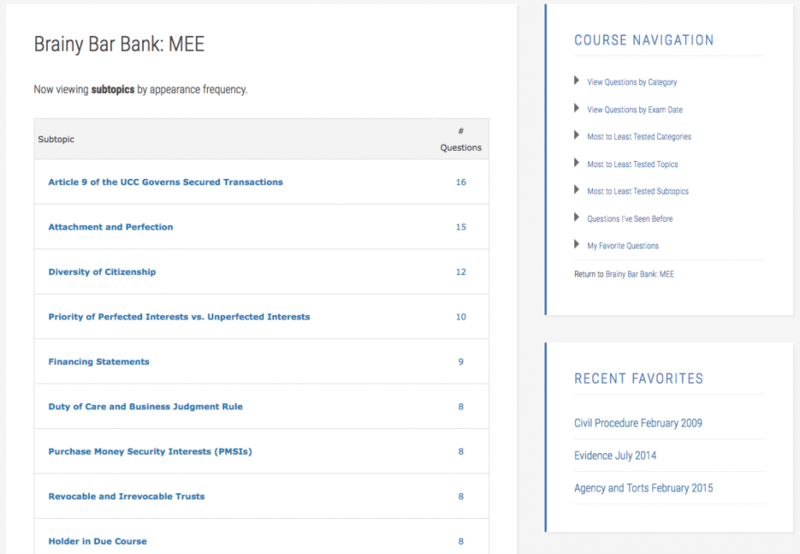 Just as in the MEE Brainy Bar Bank, you can mark questions as favorites for easy reference and see which questions you’ve recently viewed. 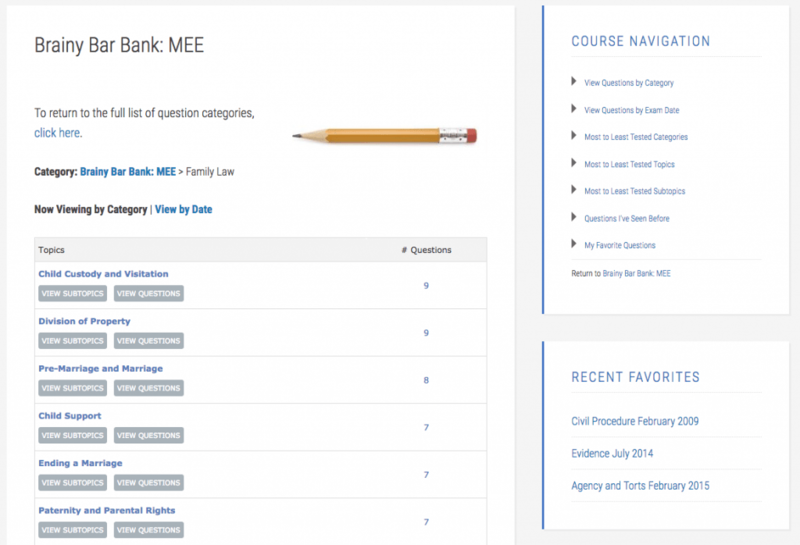 The BBB Makes Bar Exam Practice Easy! Studying for the bar exam is hard enough without wasting time and energy trying to figure out what to work on and finding the practice questions. The Brainy Bar Bank makes it easy for you! Ready to sign up? Just click here to get started. Please read on for some frequently-asked questions. 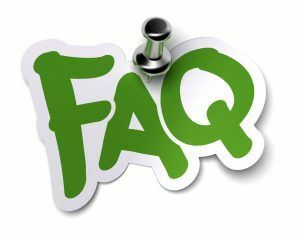 If your question isn’t answered, feel free to contact us and ask! Which jurisdiction should I select? 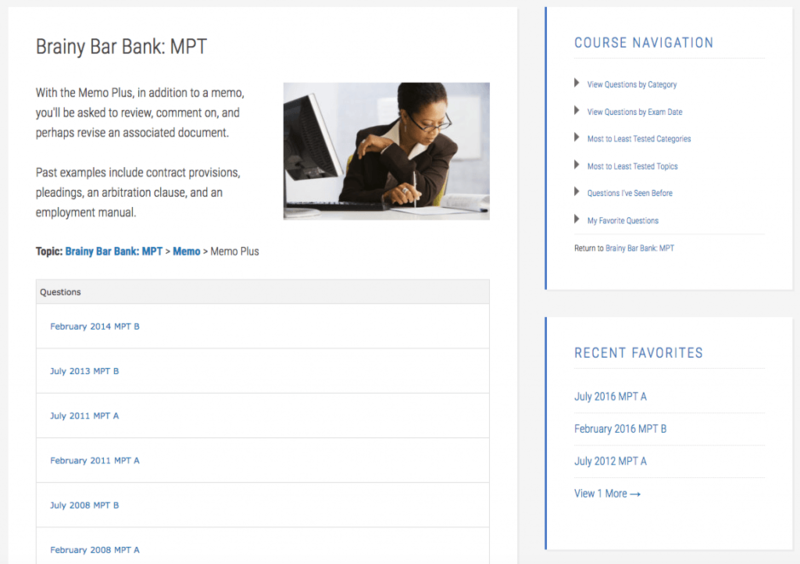 If you’re not sure if your jurisdiction uses the MEE and/or MPT, check out the National Conference of Bar Examiners website for a list with updated information. You can purchase the MEE and MPT versions separately, or get both together for a special discounted price. If you’d like to add our popular Writing of the Week (WOW) program, that’s also possible, with an additional discount. Jump down for full pricing information. If you aren’t taking a UBE bar exam, check out the Brainy Bar Bank for California. How long will I have access to the BBB? Your access to the BBB will be active for a full year from the date you sign up! If you decide to take a later bar exam, we can adjust your “start date” so that you will have full access during your exam prep period. Are all of the past bar exam questions in your database? Yes they are, if they’re still tested. 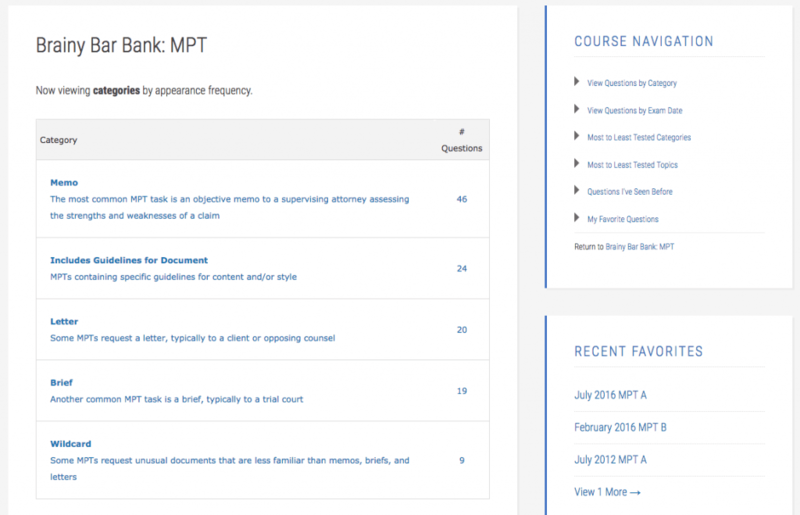 We have omitted questions that are no longer relevant, but there are over 12 years of MEE questions and 20 years of MPT questions. That’s plenty of practice! The BBB will be updated with new questions as they are released with point sheets. Can you tell me what are the heavily tested issues on the bar exam? Yes, definitely! 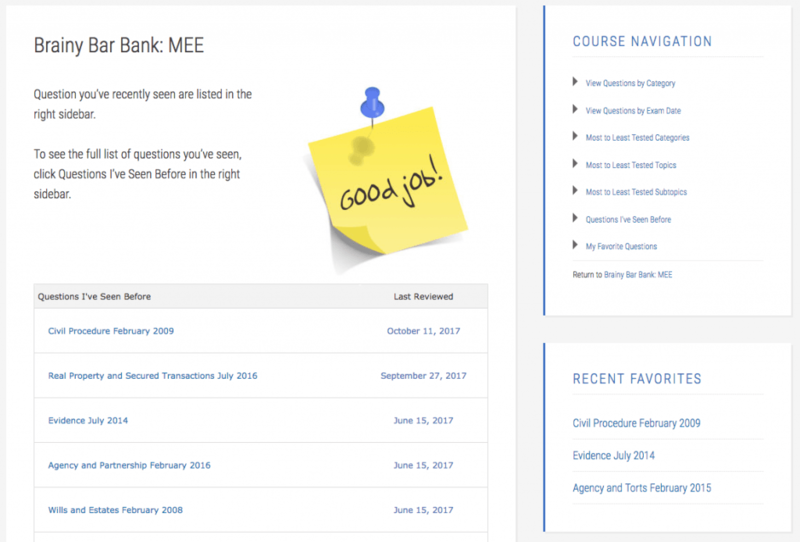 The BBB lists the most commonly-tested areas of the law, and also shows you the most heavily-tested topics and subtopics overall and within each major area (hopefully you like Civil Procedure, because that subject is very frequently tested!). If something has shown up many times over the years, we’d suggest being ready for it (although, of course, there’s no guarantee that popular topics will appear on any given test). Is the Brainy Bar Bank for first-time or repeat takers? 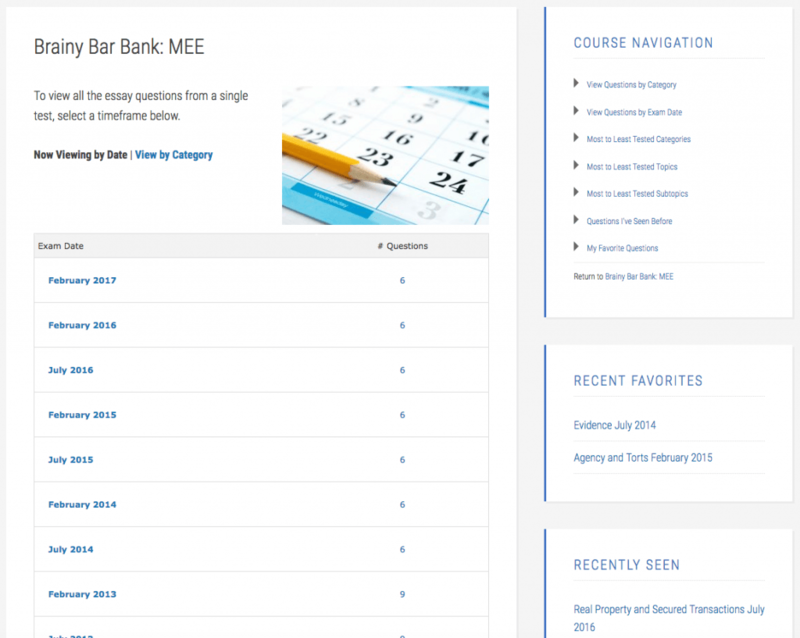 All bar studiers can benefit from the Brainy Bar Bank. 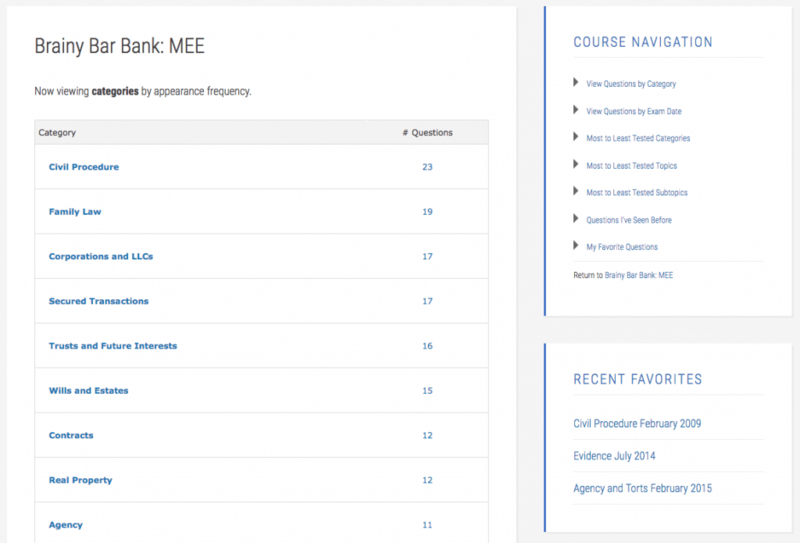 If you are using a commercial course, you can use the Brainy Bar Bank to strategically study heavily tested topic areas or areas you are struggling with outside of your course materials. 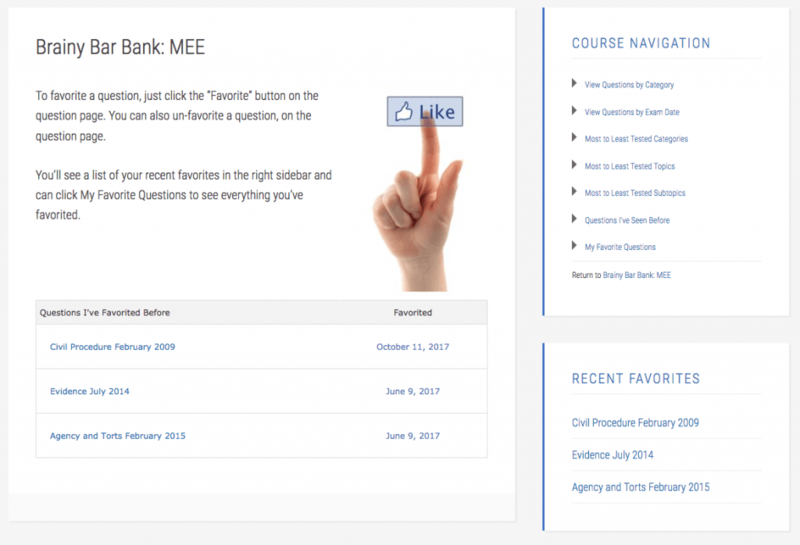 If you are a repeat taker, the Brainy Bar Bank can give you a fresh set of questions to work on outside of the commercial items you have used in the past. 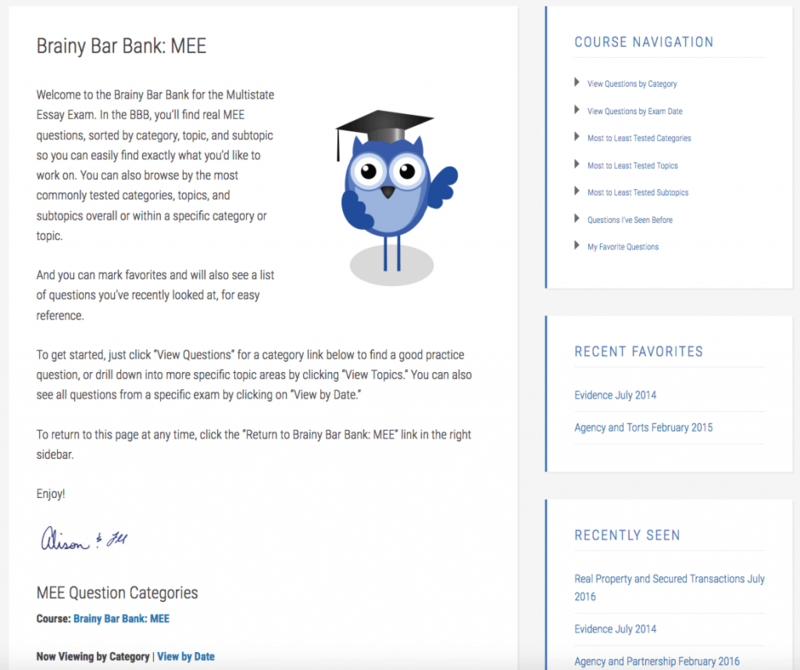 What have previous students said about the Brainy Bar Bank? What if I am struggling with my writing and need more help? You may want to check out our Writing of the Week (WOW) course (available at a discount when bundled with the BBB) or our one-on-one tutoring options. We also have these helpful (and free) podcast episodes on the bar exam. Please select the appropriate option below to get immediate access to the Brainy Bar Bank. You can purchase the MEE-only or MPT-only versions, or get the full UBE (MEE + MPT) and save. Many students prefer to combine the Brainy Bar Bank and the Writing of the Week (WOW) Workshop, for structured practice and increased accountability. (If you’d like to learn more about the Writing of the Week (WOW) workshop, please click here.) We’re pleased to offer each BBB + WOW bundled at a discounted rate. Read on for details!